It was an alarming sight. On Tuesday, with the eyes of the French press fixed on ceremonies to mark President Emmanuel Macron’s long-awaited cabinet reshuffle, Paris police conducted a series of morning raids against the country’s most prominent opposition party. Not only did police forces search the headquarters of La France Insoumise (LFI; “France Unbowed”). They also raided the home of its leader, Jean-Luc Mélenchon; the homes of several parliamentary assistants; and the office of the Left Party, a small party tied to LFI. The official reason for the searches: two ongoing police investigations spurred by the country’s anti-corruption authorities. One concerns the use of European Union funds reserved for European parliamentary assistants; the other, the financing of the 2017 presidential campaign. Nobody from La France Insoumise has been formally charged with any wrongdoing. And police raids on prominent political figures are, in fact, somewhat common in France: former prime ministers François Fillon and Dominique de Villepin and former government spokesman Jean-François Copé have all been subject to them in recent years. Still, they are no small matter, and La France Insoumise’s leaders reacted as such — with gusto and with moral outrage. Other prominent left-wing figures in France have condemned the raids, including Benoit Hamon, the Socialist Party’s 2017 presidential candidate now at the helm of new party Générations, and the New Anti-Capitalist Party (NPA). Left-wing politicians from across the continent also took to Twitter to express solidarity. Among them: UK Labour Party member of parliament Jon Trickett, Pablo Iglesias from Spain’s Podemos movement, and Marisa Matias of Portugal’s Left Bloc. Like every other 2017 presidential candidate, Jean-Luc Mélenchon has already seen his campaign fundraising and spending accounts validated by France’s campaign finance commission, the CNCCFP. However, in March of this year, the commission signaled a handful of irregularities to legal authorities: they center around €440,000 billed to an association run by two current France Insoumise members of the National Assembly and €1.61 million billed to a communications consulting group. Later this spring, police opened an investigation. That joined a separate inquiry already underway over the party’s use of funds reserved for assistants in European Parliament. Whatever the result of the ongoing probes, France Insoumise and its supporters have raised some valid concerns. On a basic level, there is the striking display of police rummaging through the headquarters of a political party and seizing data. Police raids are a common tool in French legal inquiries, but that doesn’t make them any less troubling to those targeted. There is also the question of timing. 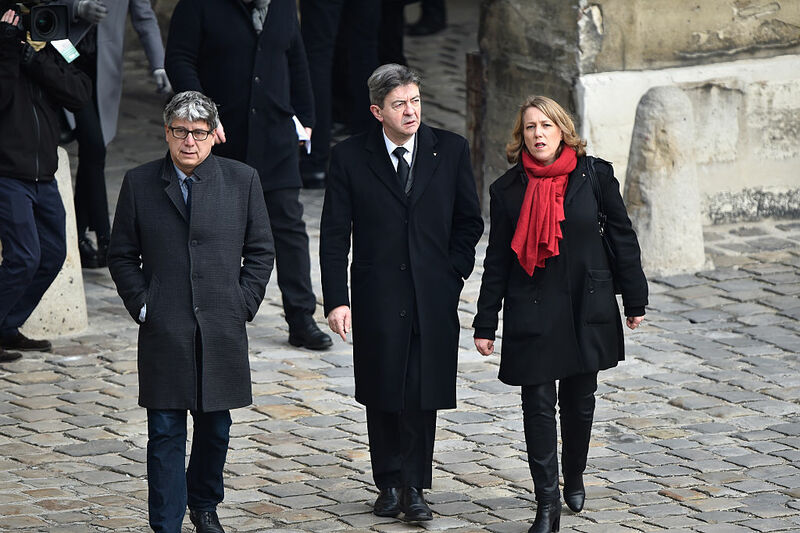 Whoever ultimately signed off on the morning raids — Mélenchon insists it was the Justice Ministry itself, though the latter has pointed to anti-corruption authorities and the High Court of Paris — the date chosen for the operation is eyebrow-raising. Macron appointed three new people to his cabinet on Tuesday, including confidant Christoph Castaner to the ultra-powerful Interior Ministry. Finally, there is the matter of campaign finance irregularities within Macron’s own 2017 presidential bid. Critics are peeved about the apparent lack of scrutiny with which they’ve been met. In February, the campaign finance commission signaled to authorities four individual donors who contributed above the legal amount of €4,600. But as Le Monde reported, the Paris High Court shelved its investigations into the matter this spring. That’s not all. While internal campaign finance commission rules authorize candidates to receive discounts from vendors as long as they don’t exceed 20 percent, prominent media outlets have all reported on Macron’s presidential campaign surpassing that limit in several cases. In the most conspicuous of them, a Parisian theater owned by a major Macron supporter gave the candidate a supposed 75 percent discount for an event. Still, the incidents haven’t seemed to provoke much in the way of legal probes into Macron’s party. The head of the CNCCFP has defended his handling of the matter, arguing in June that allegations of improper discounts weren’t strong enough to warrant further scrutiny. Critics of the CNCCFP have argued another fact could explain the inaction. The head of the commission, François Logerot, saw a 57 percent salary increase in May, from €4,500 to €7,000 a month. In its official statement condemning Tuesday’s raids, France Insoumise directly called into question that pay hike. Jean-Luc Mélenchon has ramped up his criticism of Macron in recent months, calling him everything from a “xenophobe” to a “counter-humanist” to “chaos” incarnate. With European elections approaching in May 2019, the left-wing parliamentarian has sought to turn the vote into a referendum on France’s unpopular president. At the same time, he has said he’d be delighted to see Macron leave office before the end of his five-year term. And this dispute looks set to continue. On Wednesday morning magistrates began a separate investigation into alleged “threats,” “intimidation,” and “violence” against the police and judicial authorities themselves, as France Insoumise deputies attempted to push their way back into their own headquarters.